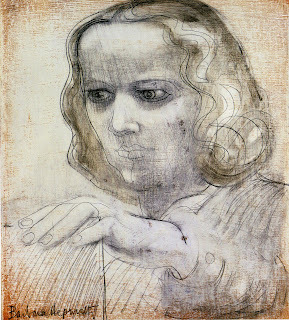 A self portrait of artist Barbara Hepworth, a British sculptor (sculptress?). Her work became well known in the 50s (somehow I'm currently stuck time here). Her work is abstract and usually a contrast between open and closed shapes, heavy and light elements. I was surprised to find this self portrait because it is so painterly. I really like the texture and lines; their loopy ease opposite the intensity of her eyes.